There are few topics that are the source of greater controversy (at least in the United States) than the topic of evolution. Evolution is the source of controversy within churches, schools, the halls of government, and even popular culture. Over 150 years after the publication of Charles Darwin’s The Origin of Species, this controversy shows no signs of slowing. For Christians seeking to get a grasp on the complexities of the controversy, the number of books and articles defending and critiquing various views can often become overwhelming. Terms such as “Neo-Darwinism,” “Intelligent Design,” “Young Earth Creationism,” “Punctuated Equilibrium,” “Theistic Evolution,” “Evo-Devo,” “Irreducible Complexity,” and many more are commonplace in the writings devoted to the subject. For the interested layman, understanding who is saying what, and why, can be difficult. 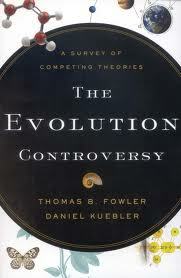 The Evolution Controversy by Thomas Fowler and Daniel Kuebler is not another book advocating a particular position in the debate. It does contain an annotated bibliography for those looking for such books and articles, but it is itself not one of those books. The stated purpose of this book is to provide “an unbiased scientific overview of the leading theories about evolution” (p. 13). In other words, it is a survey of the different views. It does not, therefore, get into any in-depth discussions of philosophical, theological, or exegetical issues. Despite the fact that the authors’ intention is not to defend any particular view but only to provide an accurate, balanced, and in-depth survey of all the major views, such a goal remains a tall order. On an issue as hotly debated as this one, it will be interesting to see whether proponents of the major views believe that their position is presented fairly. The book itself is divided into three major parts. In Part One, the authors examine in four chapters the background issues they consider necessary to an understanding of the controversy. In Part Two, separate chapters are devoted to an in-depth look at each of the four major schools of thought. Finally, in Part Three, the authors discuss some of the public policy implications of the controversy. Fowler and Kuebler begin by clarifying the definition of “evolution.” They helpfully distinguish different ways that the word is used, pointing out that equivocal uses of the term have caused some of the confusion in the controversy. The authors also point out the distinction that must be made in science between facts, inferences, and philosophies based on such inferences. This is important because in this controversy inferences are often presented as facts. In chapter 2, the authors provide a summary history of the idea of organic evolution from ancient times to the present day. Readers should know that there were philosophical and biological precursors to Darwin. In other words, the idea did not appear suddenly and without precedent in the middle of the nineteenth century. In chapter 3, Fowler and Kuebler lay out the “raw data” that any theory of origins must explain. In other words, this chapter sets forth the basic observations that scientists from each of the various schools of thought have made and are able to make. Such “raw data” includes the fossil record; the observable geological features of the earth; the anatomical, physiological, biochemical, genetic, and functional similarities among various creatures; the distribution of flora and fauna; the adaption of flora and fauna to their environment; and the complexity of biological molecules, systems, and structures. Scientists within each of the major schools of thought attempt to explain these observable details of the physical world. Common descent of organisms from a single progenitor versus common design plan. The ability of random mutation to create new biological information. The efficacy of random mutation coupled with natural selection. The age and chronology of the earth and the universe. The scope of naturalistic explanations in science. What constitutes a bona fide scientific theory. The authors look at each of these points, explain the position of the various schools of thought on each one, and explain the way each point affects those schools’ overall view. In Part Two, the authors turn to a survey of the four major positions. Each of the four chapters in this section is devoted to an in-depth explanation of one of the four main views. In each chapter, the authors attempt to look as objectively as possible at the strengths and weaknesses of the theory under consideration. In chapter 5, they look at Neo-Darwinism, the dominant position within the modern mainstream scientific establishment. Chapter 6 is devoted to an examination of the Creationist school of thought. In chapter 7, the authors look at the Intelligent Design Movement. Finally, in chapter 8, they look at what they have termed “Meta-Darwinism.” The various theories under this umbrella term seek to supplement Neo-Darwinism with additional naturalistic explanations. Where do the theistic evolutionists fit within this scheme? Theistic evolutionists are found in all camps except the Creationist camp. Theistic evolution is an attempt to harmonize or reconcile theological doctrines and the Bible with some particular scientific understanding of evolution. It comes in many varieties, including continuous creative activity, “front loaded” activity, and completely indirect or hands-off approaches. Theistic evolution is thus not a new scientific theory to explain observed facts, but rather an interpretation of some existing scientific theory (p. 25, n. 4). The four chapters in Part Two are particularly helpful in that they carefully explain what each school of thought does and does not teach. This is necessary because the heat of the discussion has led at times to misrepresentations of what one or another school actually teaches. Since it is impossible to evaluate an idea if that idea is not accurately understood, the authors provide an invaluable service by clearing away many of the misrepresentations. The fact that the authors subject each of the four views to detailed scrutiny and critique, however, means that there will likely be proponents within each of these schools who are not entirely happy with the book. In this reviewer’s opinion, however, the authors have done the proponents of each school a service by forcing them, if necessary, to move beyond rhetoric and deal with the arguments. Many proponents of each school already acknowledge the weaknesses in their arguments that Fowler and Kuebler point out. This book can only help them as they seek either to strengthen those arguments or replace them with stronger ones. Regarding Neo-Darwinism, the authors observe that among the stronger arguments for the theory are the observed physiological and genetic commonalities found among different species. On the other hand, weaknesses are seen in Neo-Darwinism’s propensity to confuse “just-so” stories with actual arguments and to equate microevolution with macroevolution. To propose, for example, a story of how something could have happened is not a proof that it did happen in that way. Unfortunately, many Neo-Darwinians seem to think that such hypothetical stories constitute evidence. Many Neo-Darwinists also assume that evidence for microevolution (which is accepted by proponents of all schools including Creationism) is proof of macroevolution. As Fowler and Kuebler point out, this is simply not the case. In their discussion of Creationism, the authors point out that many proponents of this school of thought have rested almost everything on the argument that the earth is less than 10,000 years old. They note that there are many “old earth” Creationists, but focus on young-earth Creationism since it represents a completely different interpretation of the “raw data” discussed in chapter 3. Old-earth Creationists believe that young-earth Creationists have misinterpreted the early chapters of Genesis and that this misinterpretation forces them to interpret the observable data differently. The authors do not discuss this exegetical debate. Instead, because the age of the universe is key in this discussion, the authors devote much of the chapter to evaluating the various arguments and theories that Creationists have proposed to explain the apparent old age of the universe (e.g., the proposal made by some Creationists that the speed of light has changed). They also look at various Creationist explanations of the observable geological features of the earth, explanations which are usually related in some way to the Genesis flood. In other words, geological features that Neo-Darwinists would attribute to very slow and gradual processes are attributed by Creationists to catastrophic processes associated with the worldwide upheaval caused by the flood. The authors take a particularly close look at Walter Brown’s hydroplate theory because it makes testable predictions that can be verified or falsified (They note that some have already been verified). The authors point out, and many proponents of Creationism readily admit, that the major hurdle faced in the effort to have Creationist theories taken seriously by those who are not Creationists, is the apparent age of the universe. This issue, therefore, remains at the forefront of Creationist research. A system performing a given basic function is irreducibly complex if it includes a set of well-matched, mutually interacting, nonarbitrarily individuated parts such that each part in the set is indispensible to maintaining the system’s basic, and therefore original function. The set of these indispensible parts is known as the irreducible core of the system (p. 253). An example the authors provide to illustrate this concept is an old pocket watch. The glass and the chain are not essential, but there are a set of gears that are absolutely essential for the watch to function. If even one of these gears is removed, the watch ceases to function completely. It does not retain some of its ability to keep time. Instead, it is completely unable to keep time. Furthermore, the new arrangement of the watch minus one of its gears, serves no new function. Proponents of Intelligent Design argue that many biological systems are irreducibly complex in a similar way and, more importantly, that such systems could not have been the result of the gradual step by step assembly required by Neo-Darwinism. Because Intelligent Design is still in its early stages, the observations of Fowler and Kuebler regarding its strengths and weaknesses should prove beneficial to its proponents as they continue to refine their work. The punctuated equilibrium theory of Steven Jay Gould and Niles Eldredge. The idea of hierarchical selection also proposed by Gould and Eldredge. The idea of exaptation proposed by Gould and Eldredge. The neutral theory of molecular evolution proposed by Motoo Kimura. The idea of developmental mutations (evo-devo) proposed by Sean Carroll and Jeffrey Schwartz. The theory of morphogenic fields proposed by Brian Goodwin. The self-organization/complexity theory of Stuart Kauffman. The theory of endosymbiosis proposed by Lynn Margulis. Because the proponents of these various theories do not agree on every point, the authors’ task is made somewhat more difficult, but they do a good job explaining complex concepts and making them understandable to readers with little or no background in the natural sciences. Who is the legitimate spokesperson for science? What types of evolution research should be funded with public money? Should equal time or any time be given in the classroom for theories other than Darwinism? Should the courts be the primary battleground for the evolution controversy, or should they not be involved at all? What are the moral and ethical dimensions of the controversy? Do purely naturalistic theories of evolution function as surrogate or virtual religions? The answer to each of these questions is disputed, and the authors provide a helpful survey of the arguments used by those on all sides of the debate. A particularly noteworthy point they make is that the truth or falsity of scientific theories should not be determined in the courts. In a final chapter, the authors summarize the major points of the book and reveal their own position. I did not skip ahead in my reading of the book to discover the position held by the authors because I wanted to see if I could guess it by detecting any bias in their presentation of the various views. The fact that it was somewhat difficult to guess precisely indicates that the authors largely succeeded in their quest to present all of the views as objectively as possible. For those readers who are interested, Fowler and Kuebler believe that there is some evidence favoring the Darwinian account of evolution. They also believe there is evidence against it and problems with the theories associated with it. Furthermore, they do not believe that supporters of Darwinism are always candid about those problems. They believe that each of the other three schools face problems as well that must be met head on, but they believe that none of the three can be definitively ruled out at present. They do state, however, that they believe young earth Creationism faces the most serious hurdles. Creationists will, of course, strongly disagree. Since the stated purpose of this volume is to evaluate the strengths and weaknesses of the four major schools in regard to their handling of the common observational data available to all, it succeeds rather well in reaching that goal. A problem arises, however, since proponents of each of the schools look at all of this evidence with different starting assumptions. For Creationists, whether old-earth or young-earth, and for some proponents of Intelligent Design, the teaching of Scripture is necessarily taken into account. On the other hand, those Neo-Darwinists and Meta-Darwinists who are not also theistic evolutionists do not consider Scripture relevant to the debate at all. What this means is that the controversy will not be resolved by mere study of the “raw data.” Underlying philosophical and religious (or anti-religious) assumptions must be taken into account as well. Although Fowler and Kuebler recognize this, they purposely limit themselves to a discussion of the observable natural evidence. This means that while their book is very helpful in many ways, it will have to be supplemented by other works dealing with underlying philosophical and metaphysical questions. One such question concerns the very definition of “science.” Considering the limited purpose of the book, my only serious complaint is that the authors did not spend more time discussing this issue. Neo-Darwinists regularly mock Creationists and Intelligent Design proponents for advancing arguments the Neo-Darwinists consider to be “unscientific.” On the other hand, proponents of Creationism and Intelligent Design argue that many aspects of Neo-Darwinism are “unscientific” and use many similar arguments. They argue, for example, that Neo-Darwinism incorporates philosophical issues into its “scientific” theory. The problem is that so much of this controversy involves historical events that are unrepeatable and untestable. It also involves events that some claim occur very gradually over enormous periods of time. Such events are therefore unobservable. Because of this, it is necessary to understand precisely how the study of such events fits within the normal definition of “science.” The authors indicate early on that they will not be dealing at any great length with detailed philosophical and religious aspects of the debate. However, since even the discussion of “scientific” evidence requires some kind of agreement on the definition of “science,” it seems to this reviewer that more discussion of this particular philosophical question might be necessary.